In the twilight hours of late Wednesday evening and early Thursday morning last week, a small group of GSA staff were allowed behind the scenes at Harvey Nichols in Edinburgh to set up a pop-up exhibition and shop showcasing products based on mid-century textile designs in the GSA archives. This project follows on from the exhibition Pioneers of Post-war Pattern which took place in GSA’s Reid Building last year. Cushions and tea-towels featuring designs by GSA alumnae Sylvia Chalmers, Dorothy Smith and Margaret Stewart have been digitally reproduced by the School’s Centre for Advanced Textiles in collaboration with GSA’s Department of Fashion and Textiles. As you can see, the designs demonstrate an eclectic mix of vibrant colours and abstract patterns. They’re evocative of the mid-twentieth century but we think they still hold their own in the 21st! Some of the designs have never been previously produced as textiles. However, these cushions and tea towels can now be purchased from Harvey Nichols during the Festival Fringe 03-27 August; fabric lengths can also be ordered by the metre. We recommend a visit if you are in Edinburgh this month. 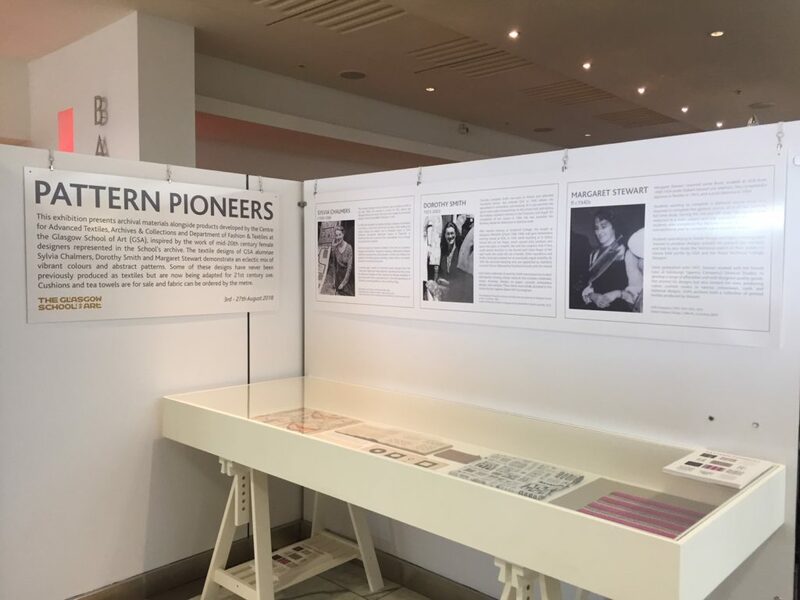 The pop-up shop and a small exhibition of related archive material is on the 4th floor of Harvey Nichols – perfect for a stop off and some retail therapy!